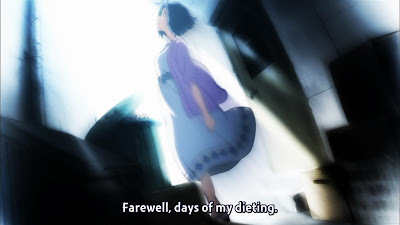 With the few weeks that I was busy, three more episodes of this anime came out. The fact that I had no inclination to watch them until I almost forced myself to probably means my interest in this is at another low. I do hope it picks up again. It looks like Ryuuguu Komachi will be the backdrop of every episode, considering they've been showing up consistently no matter who the focus is. This week was Ami and Mami; I'm a little disappointed that they didn't get individual episodes. Since this is a longer series, though, there's plenty of time for the idols to get more than one episode each. 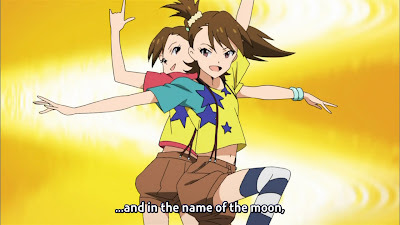 I've been waiting for an Ami/Mami focus since even before the time the side group was announced. Unfortunately, this episode didn't really go the way I had hoped, which left me a little disappointed. When the episode began with a dark and rainy night in a large and creepy mansion, I knew right away that it was probably just some kind of show. 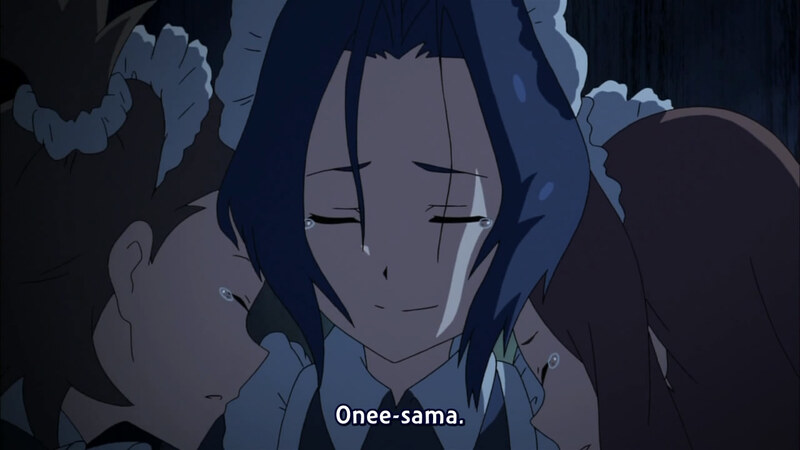 After all, Ami showed up and called Iori "onee-sama", which obviously wouldn't make sense otherwise. 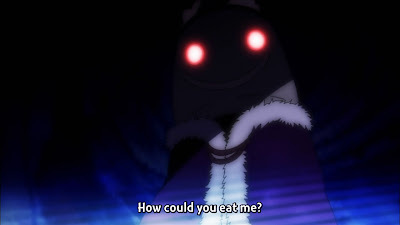 Anyway, the cheesy acting and super-overdone storyline of the show (within the episode) was kind of funny to sit through; I found myself wondering about my choices in anime while watching the culprit blurt out that he was the culprit. It did turn out to be a mini-drama starring the three girls as sisters, as expected. I hoped against hope with Ritsuko commented that there was a terrible occurrence to happen at 765 Production that she was actually serious. 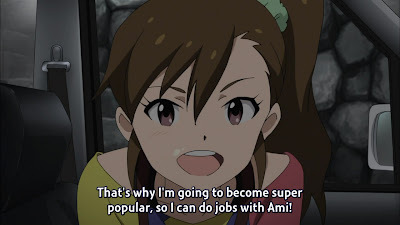 It was obvious as she drove the girls that Ami would be the focus of the episode; as Producer drove Mami back from a separate audition, it became clear that she would be the focus as well, leading to the rekindling of the "twinship". 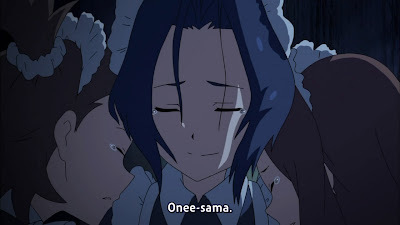 The plot was essentially that Iori had gone out of her way to get some Gorgeous Celeb pudding, which apparently sells out 5min after it starts selling everyday. She intended to share it to celebrate the end of the shooting, but found that it had (typically) disappeared from the shared fridge at the office. The art for Mami's face seems a little weird. Ami and Mami immediately jumped at the chance to play detective in their own fun ways, and began questioning who could have stolen it. Ritsuko and Producer were both with one of them for the entire day, while Kotori had a cavity and most likely wasn't masochistic enough to eat sweets. It was cute to see how over-the-top the twins got when they were together; despite being separated after being together almost all day and everyday, they're still able to jump back into their own world at a moment's notice. A lifetime of practice will do that, hm? With all of the idols having dropped by the office at one point or another, the first suspect was Yayoi, who had been cleaning up the kitchen as she did everyday. To be truthful, this scene had its ups and downs. 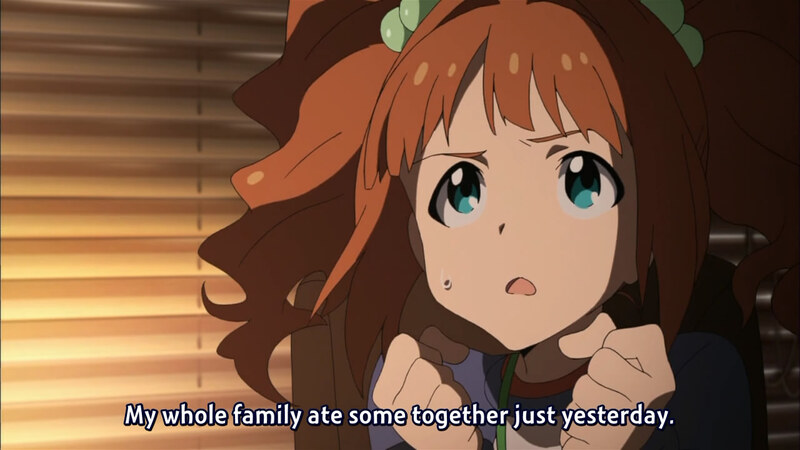 It was funny how Yayoi deadpanned as Ami/Mami played their mock roles; she responded to the comment that she was making her mother in the countryside cry with the fact that her mother was at home. However, I disliked how Ami/Mami insinuated that it was poverty that would make Yayoi stoop to stealing food out of the fridge. Yayoi didn't seem too bothered by it, so I accepted my typical ploy of not making an issue if the victim doesn't feel victimized, but it still did annoy me. She's poor, not morally bankrupt; there's a difference. With Yayoi being cleared of suspicions, their next target was Makoto, who was wandering around mumbling "bittersweet" and "sweet". Thinking that she was talking about the taste of pudding, they chased her only to find out that she was frustrated with her song lyrics, which contained some overused lines. 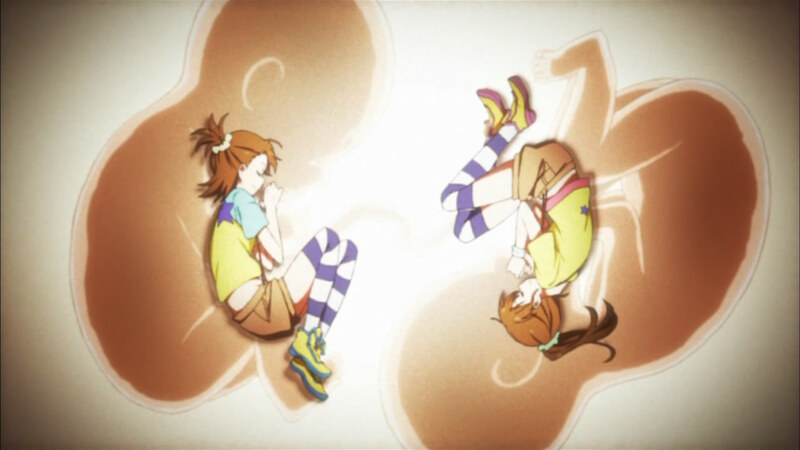 Just as they were told to find Yukiho, as she had been asking around for Iori earlier that day to talk about the pudding, they found out that Yukiho had fainted in the kitchen, barely managing to mumble the word "Hibi". The girls took that as a short-form for Hibiki, but their plans were interrupted with Ryuuguu Komachi needing to go off to a radio show. This left Mami with Producer, which I guess means that the focus was slightly more on Mami than Ami. You may want to not deal with Producer then. Once again, I feel as though Producer is just utterly useless. He only seems to be good at talking to the girls and getting to know them; how about doing something with that knowledge? the time spent? He talked to Mami (while they were staked outside the dance studio where Hibiki and Takane were supposed to be) about her loneliness since Ami was away so often. Mami seemed pretty well-adjusted, noting that she understood the reasons and was happy for Ami, despite her own feelings. In fact, she longed to become super successful and popular so that she could even be with Ami. On that front, what is Producer really doing? He doesn't seem nearly as proactive as he should be. Finding out that Hibiki had left the dance studio quite some time ago, Mami told Producer to check the train station (as she was likely fleeing the country) while she would go back to the studio. Whether Producer actually went or not, I have no idea, but the scene intersected with Mami at the studio and Ami at the radio station. As Ami spoke about the mini-drama that the girls had just finished filming, she realized the juxtaposition with the current situation and worried for Mami's safety. 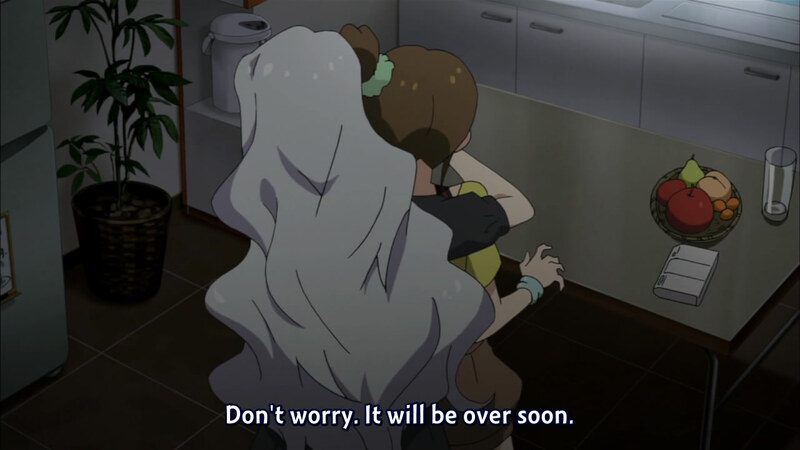 At the same time, the "true culprit" showed up - Takane, as she she restricted Mami, telling her it would be over soon. The deadliest kind: no guilt, no remorse. When the play stopped, Miki had been the only one to correctly identify that the puddings were Gorgeous Celeb, thus raising everyone's radar. She readily admitted it, saying it was to justify the fact that her Fancy Jelly had been eaten. (What are these names?!) 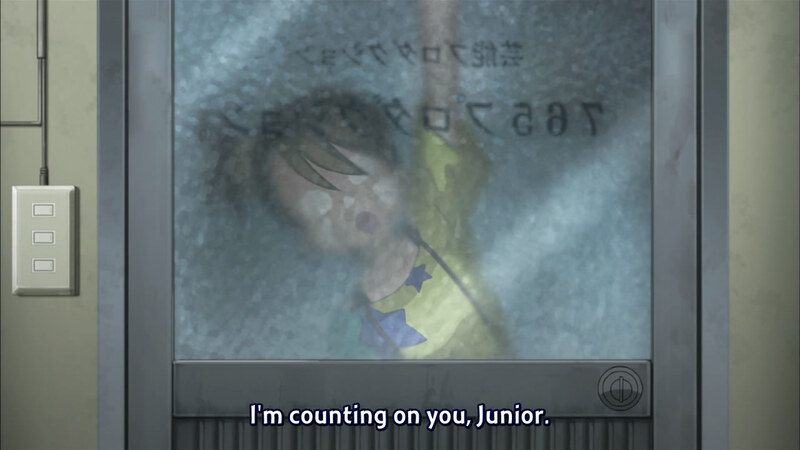 The fact that Ami/Mami had been the ones to eat the jelly brought the case a full circle, thus ending the episode. As they ran off gaily, Ritsuko attempted to call Ami back since Ryuuguu Komachi had a meeting, but Producer stopped her, saying that Ami needed a night off. I'm pretty conflicted with that idea. I'm sure it's good for Ami to get some time off so she and Mami can hang out, but it's not particularly Producer's role to call for it. I took it more in a "suggestive" way, a suggestion that Ritsuko agreed to, so it didn't anger me too much. How could you eat that much pudding...? 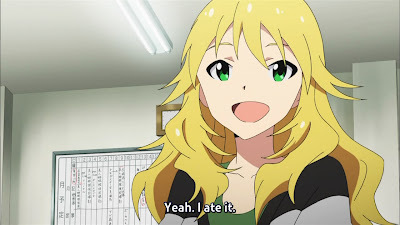 After the credits, it turned out that Miki had only eaten one and it had actually been Azusa, starving from her diet, who had eaten the remainder, before the group headed out for the shoot in the morning. That little bit was funny enough to end the episode off on a good note. Otherwise, it was a pretty plain one, despite focusing on characters that I'd been wanting to see for a while. I don't feel entirely disappointed, but I don't feel good about it, either. I just don't know what I can hope for from this series any more.